May 17, 2013… A hilarious battle of wits plays out in one of Noël Coward’s most celebrated comedies, Blithe Spirit. Directed by long-time Festival favourite Brian Bedford, the gorgeously designed production started previews on Thursday, May 16, at the Avon Theatre. Mr. Bedford, whose recent double triumph as director and star of The Importance of Being Earnest thrilled audiences first in Stratford and then on Broadway, returns for his 28th Festival season. Widely regarded as an authority on Coward’s work, he has not only directed and acted in Blithe Spirit several times, he also knew the English playwright personally. Set in an exquisite 1940s Georgian style English house, Blithe Spirit centres on Charles, an author who cheekily engages a medium, Madame Arcati, to conduct a séance as research for his latest novel. Things go decidedly not as planned when she inadvertently raises the ghost of his late wife, Elvira, much to the chagrin of his current wife, Ruth. As the only one who can see or hear Elvira, Charles must figure out how to entertain his ethereal house guest without stepping outside of matrimonial bounds. Trying to keep everyone happy, as it turns out, is a hilarious challenge. The cast features Ben Carlson as Charles Condomine, Michelle Giroux as Elvira Condomine, Seana McKenna as Madame Arcati, Sara Topham as Ruth Condomine, James Blendick as Dr. Bradman, Susie Burnett as Edith and Wendy Thatcher as Mrs. Bradman. The artistic team features Set Designer Simon Higlett, Costume Designer Katherine Lubienski, Lighting Designer Paul Miller, Sound Designer Jim Neil and Stunt Coordinator John Stead. The Forum, the new festival within the Festival, is a series of activities and events designed to make a visit to Stratford an immersive, all-encompassing cultural experience. Through debates, talks, concerts, comedy nights, hands-on workshops and more, The Forum will offer theatregoers more ways to discover and examine the themes running through this season’s productions. Themes related to Blithe Spirit will be explored through several Forum events, including a Talking Theatre series, in which discussions are led by Artistic Director Antoni Cimolino and Education Consultant Pat Quigley on a variety of topics such as The Dynamics of Marriage, Woman as Stereotype, “Dying is fine, but death…” and Premonitions and the Supernatural, as embodied in many of this season’s productions. Blithe Spirit officially opens on June 1 and runs until October 20. 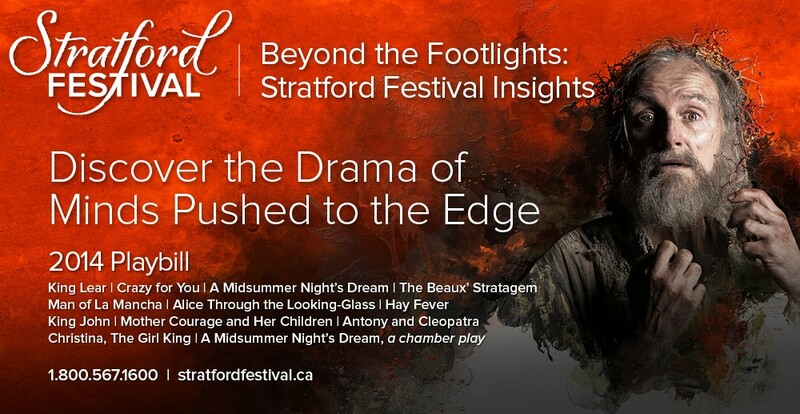 For tickets, contact the box office at 1.800.567.1600 or visit www.stratfordfestival.ca. Blithe Spirit is sponsored by CIBC. Production support is generously provided by Nona Macdonald Heaslip, Sally & Larry Rayner and John H. Whiteside. This entry was posted in 2013 Season and tagged Anita Gaffney, Antoni Cimolino, Ben Carlson, Blithe Spirit, Blythe Spirit, Brian Bedford, James Blendick, Michelle Giroux, Sara Topham, Seana McKenna, Stratford Direct, Stratford Festival 2013, Stratford Festival Blithe Spirit, Stratford Festival Blog, Stratford Festival Blythe Spirit, Susie Burnett, The Forum Stratford Festival, Wendy Thatcher by Stratford Festival. Bookmark the permalink. This is the production I have been most eagerly anticipating. It was one of my very first shows as a girl. I can’t wait to see it!